Material: PU leather. Not fit models: Especially small cars, the seat chair of big arc and luxury front seat retractable car model. Style: Single seat without backrest;. our goal. Quantity: 1pcs. Compatibility list. 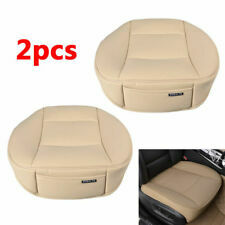 2Pcs Universal Luxury PU Leather 3D Full Surround Car Seat Protector Seat Cover Accessories. Material: 3D Soft PU leather with Sponge double layer composite. High quality PU leather, comfortable breathable. Suitable: Universal for all the cars. - The seat have pocket design, lightweight & easy to take. Material: Leather. -High-quality leather,dirty and easy to clean. -Leather bag heat-resistant grinding, comfortable and breathable. 2xFront seat cover ( front backrest: 72x55CM Front seat: 59 x60CM). ----1xRear seat cover (125x60CM). ----1xRear seat bottom cover (115x53CM). 1 PC Universal New PU leather luxury car cover car seat protector seat cover for BMW&Toyota& VW. Not fit models: Especially small cars, the seat chair of big arc and luxury front. Material: PU leather, bamboo charcoal (Note bamboo charcoal be a bit hard.). Not fit models: Especially small cars, the seat chair of big arc and luxury front seat retractable car model. 1 x seat cover(JUST 1 PCS front seat ). Easy to install and take off from car seats with hook and chuck on the seat cover. 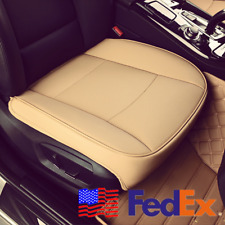 ♛Natural and Efficient for Non-slip Rubber-soled - luxury car seat covers without toxin, bottom pad designed with anti-slip rubber, prevent falling off from your car driver seat. ♛Edge Wrapping Design for Car Seat – Both sides of car seat cushion with wrapping design shows rich in stereoscopic vision. Black Car Seat Headrest Neck Pillow Neck Rest Cushion Pad Neck Safety Support. 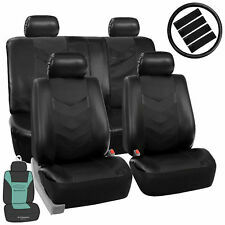 Pair Car Front Seat Cover Cushion Protector Lumbar Mat Black Gray PU Leather. 9-Seats Deluxe Edition Universal Auto Car Seat Cover Mat PU Leather Chair Cushion. (Material: PU leather. Not fit models: Especially small cars, the seat chair of big arc and luxury front seat retractable car model. Style: Single seat without backrest;. 1) There might be slight color deviation due to different displays;. > 2 x Waist Pillows. PU Leather & Sponge & Fabric. 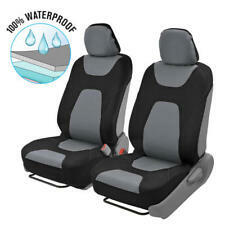 The seat covers do not fit on vehicles with sports seats or leather seats with integrated headrests. > Buy now and protect the original, or make the older seats look like new again. > 2 x Waist Pillows. The seat covers do not fit on vehicles with sports seats or leather seats with integrated headrests. > This car seat cover set is easy to Install and wash up. > This car seat cover set has Spandex Back. Material Type: leather pu and ice silk. Item Type: Seat Covers. Easy to install,practical,Whole surrounded,protects original seats perfectly;. 2pcs front seat cover. 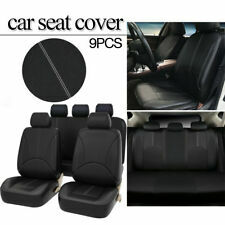 1pcs 3in1 Rear seat cover. Color : black red. 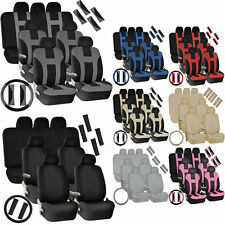 Help you easily expnd or shorten the cover to suit for your car seat model. This universal seat covers do not fit 100%. Interior Accessories & Seat Covers. See details in following Compatibility Guide. 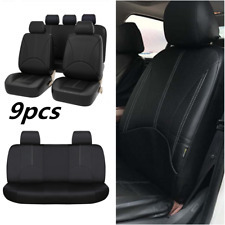 Black PU Leather Car Seat Covers - Black Front 2pcs Full Set Protection Universal. Material : PU Leather. 2 x Front Bucket Seat Covers. Item Choice : Front Seat Cover Set. Front Seat Cover 2 x Separate Headrest Covers. Full Surround Auto Car Seat Cover Cushion Protector with Neck Pillow All Seasons. Universal Deluxe Edition Car Seat Cover Cushion 5-Seats Front Rear Linen Fabric w/Pillows. 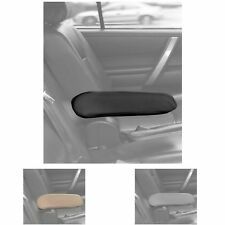 1PC Beige Wearproof PU Leather Car Front Seat Cover Cushion Mat Pad Protector. 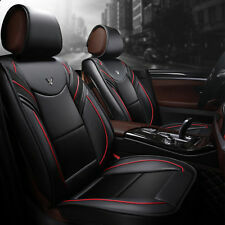 Coffee PU Leather Car Seat Cover Front Rear 5 Seats Cushion Standard Seat Covers. 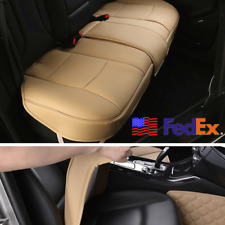 Beige PU Leather Car Seat Cover Front Rear 5 Seats Cushion Standard Seat Covers. Durable PU leather with a Four-layered construction for durability, 6MM foam padding for comfort and protection to your seats. 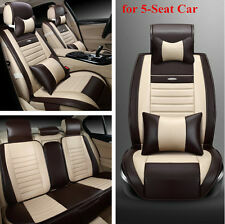 Mfg Series Number: Special leather car seat covers. Item Type: Seat Covers & Supports. Material Type: leather pu. Foam Thickness: PU leather. Car Make: For 99% car models. Suite Number: 8-12 pieces set. Large base in front row and whole surrounded design at side of front seat which has no shifting and slide protect the car seat well. Storage bag is designed for front seat which is practical. Fashion PU Leather Car Seat Cover Set Breathable Interior Accessories Decoration. 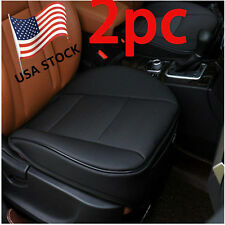 6D Full Surrounded Seat Cover Cushion Protect Front & Rear For Car SUV Truck. Large base in front row and whole surrounded design at side of front seat which has no shifting and slide protect the car seat well. Seat Covers,Waterproof Black Car Front Seat Protectors Cover Universal To Protect Seat from Sweat, Stains, and Odors (Set of 2). Protect car seat against dust and dirt. 2 Car seat cover. Suitable for most cars and vans seat. 1 Set Blue Universal Car Seat Covers Salamander Pattern Full Set Auto Seat Cover Protectors. 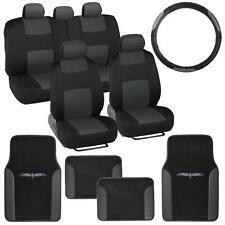 Item Type: Interior Accessories & Seat Covers. 2 x Front Bucket Seat Covers. 1 x Rear Bench Seat Covers. 1 x Rear Backrest Seat Covers.